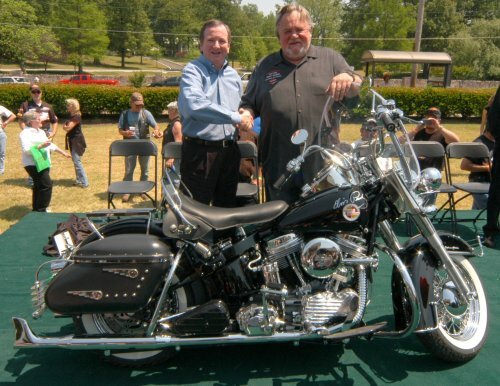 To commemorate the 30th anniversary of Elvis Presley’s passing, Bruce Rossmeyer, CEO of 11 Harley-Davidson® locations including the new Graceland Harley-Davidson in Memphis, TN, created the unique “Elvis Presley 30th Anniversary® Bike Signature Collection.” They emulate the 1957 Black Harley-Davidson FLH model that Elvis owned. 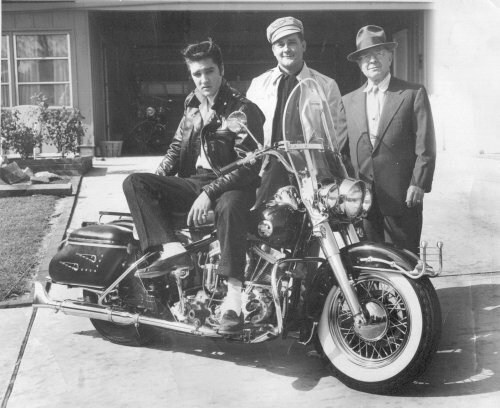 Elvis Presley takes delivery of his 1957 Harley-Davidson FLH. and at the right is Dealer B. W. Barfield (Mr. B.) 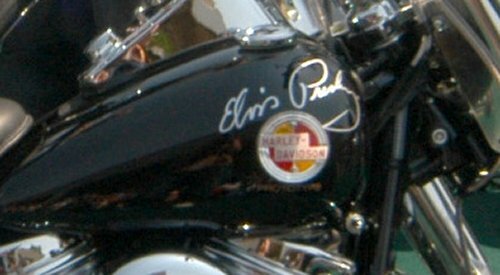 of the Memphis (Tenn.) Harley-Davidson Co.
Bruce unveiled the first motorcycle of the one-of-a-kind collection of Elvis Presley-inspired, custom-designed motorcycles at the “Elvis Rock n’ Roll Ride for Life” in Memphis, TN on April 22, 2007. Only 30 models of the “Elvis Presley 30th Anniversary Bike Signature Collection” will be created. 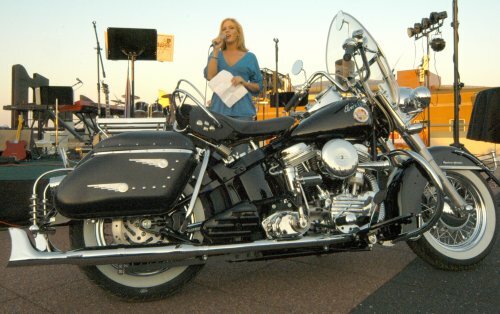 Bike number “1” (one) was sold for $100,000 with $40,000 of the price donated to the American Diabetes Association. 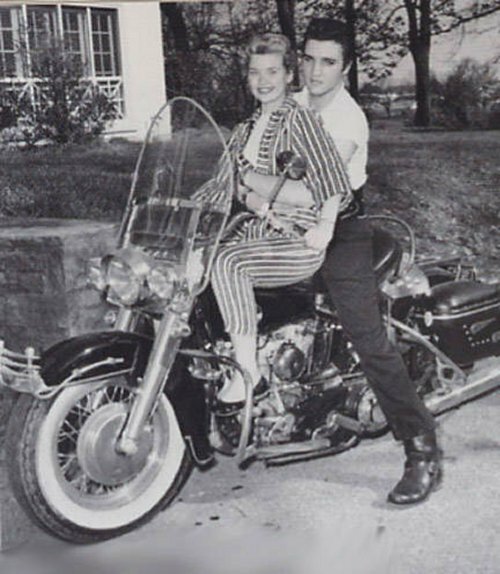 Bike number “30” (thirty) will be auctioned in Memphis, TN* on January 8th, 2008, Elvis' 73rd birthday. To purchase one of the Anniversary Bikes, please contact Lisa Rossmeyer Wade at Bruce Rossmeyer’s Southern Thunder Harley-Davidson 662-349-1099. Bikes numbered 2-24 will retail for $58,815 (USD). A new 2007 Harley-DavidsonR Softail Deluxe Motorcycle modified to externally replicate the 1957 FLH owned by Elvis Presley. Each motorcycle in the series will be numbered and marked on the gas tank and on the rear fender. A limited edition print by David Uhl - the print number will match the number bike purchased. A limited edition bronze sculpture by Jeff Decker- the sculpture number will match the number bike purchased. Two coach-class roundtrip tickets from within the continental US to Memphis for the delivery of the motorcycle and art on August 15, 2007. Two nights, hotel room at the Peabody Hotel in Memphis for the delivery - August 14 and 15, 2007. Staging of motorcycle and art at the steps of Graceland the morning of August 15th, 2007, with group and individual photos. Pre-Delivery Party the evening of August 14th, 2007 at Graceland.